LAST WEEK WE asked you if there was anything you wanted to know about the forthcoming local property tax given that there are just a few months until thousands of homeowners all over the country will become liable for it. You asked a number of questions and this week we’ve been establishing the answers to those queries for you. If you want to know the bare facts surrounding the property tax then this helpful FAQ from the Revenue Commissioners should help. This graph and this blog from the economist Ronan Lyons should also help you learn more, but these answers explore some of the subtleties and unique situations of some homeowners and should inform your understanding of just how much you will have to pay. The short answer to the last part of the question is: No. Revenue told us that it does not and will not determine the asking price of a property when it goes on the market. The amount of property tax you pay will be based on the market value of your residential property on 1 May this year. A spokesperson said: “If you follow Revenue’s guidance honestly, we will accept your property value assessment. The valuation of your property for local property tax purposes on 1 May 2013 will stay the same for 2013, 2014, 2015 and 2016 regardless of improvements you make to your property or fluctuations in the property market. This is also the case where a property is sold during that period. 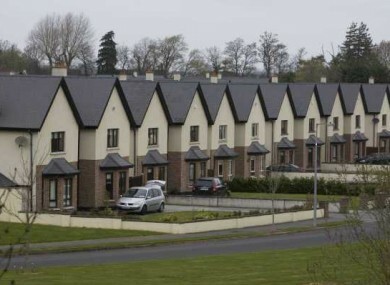 The legislation which gave effect to the property tax allows the Environment Minister Phil Hogan to prescribe a list of developments in the country which he is satisfied are incomplete to the extent that they are exempt. This list has not yet been published. It is by no means a guide but these are the estates which were exempt from the household charge last year. Some of them may now be completed or renovated to the extent that houses in them will now be liable. Revenue said that unless the residential property is specified in the list of unfinished housing estates then it will not be exempt from the property tax. An appeals process for this is not likely but would be a matter for the Department of Environment, Community and Local Government if it was something that a homeowner wished to pursue. The Revenue has pointed that the property tax is a self-assessed tax which means that the onus is on the homeowner to assess the market value of their own property as of 1 May this year. How do you do this? Well Revenue said: “A detailed explanatory booklet on the operation of the local property tax, valuation procedures and payments methods, as well as an LPT Return form for completion will be sent to residential property owners in March. Revenue will provide guidance on how to value your property. If you follow Revenue’s guidance honestly, we will accept your property value assessment. If you do not self-assess then Revenue will work off the estimate it sends every homeowner, as we reported recently. This estimate will be based on information from various sources including stamp duty records, rental details and records from the payment of the household charge. Revenue said said that in the meantime the register of residential property prices should help. 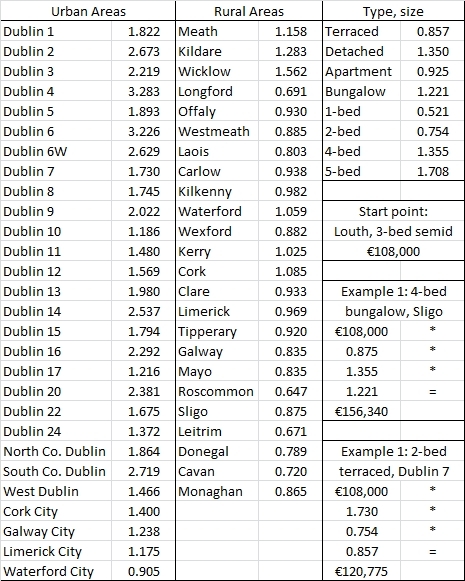 You can also have a look at this table from the economist Ronan Lyons which could help you calculate the amount due. The Revenue says that provisions similar to those for unpaid household charge will come into effect for arrears of the NPPR “in due course” so the short answer is that there is no detail on that at the moment. At the moment if the household charge for last year is not paid by 1 July this year, it will be doubled to €200 and collected through the same way in which the property tax is collected i.e. through the Revenue. Interest and penalties under the property tax system will apply to the €200. This means that Revenue will pursue payment of the tax against both parties as if they were jointly liable and it becomes the responsibility of the defendants to sort out their respective proportions of liability and payment. If you live in a house boat, tree house or a mobile home you are exempt from the property tax. Q: Ronan Gingles asked: Precisely what types of “local services” – aside from those we already pay for from income tax, many of which have been removed in recent years – will it finance? The Revenue says: “Local Property Tax will fund the provision of local services administered by local authorities.” We asked the Department of Environment, Community and Local Government for specifics and it directed us to this page on the Dublin City Council website which should outline what kind of local services will be funded. On the first point the tax remains liable on the house and you won’t be able to sell it without paying the tax together with interest and, where appropriate, penalties. Q: Louise Hanney asked a number of questions including: “Who is it that decides what the value of the house is? Is it revenue? I can’t sell mine for 135000 so what happens if they estimate it for more than that? Also do we have to pay anything for the first half of the year? The amount of property tax you will pay is self-assessed based on the criteria which Revenue will send out in March, as mentioned in a previous answer. If a homeowner does not self-assess then a calculation/estimate by Revenue will automatically apply. And, no you do not have to pay anything for the first half of the year. The property tax comes into effect on 1 July 2013. For 2013, the charge will be half what it would normally be in a full year. The full year charge will apply from 2014 and the return you submit to the Revenue will apply for 2014, 2015, and 2016 – meaning you pay the same amount – unless your circumstances change or you wish to select an alternative payment method. If you don’t pay the property tax it will be deducted at source from your salary, occupational pension, or social welfare payments including contributory and non-contributory state pensions. The Revenue has also said that normal enforcement options will be used if necessary including the sheriff, court action and attachment orders. Interest and penalties may also apply. Still got questions? Well if so and they haven’t already been answered in this Q&A or the FAQ let us know them in the comments and if we get enough we’ll do another round of answers next week. Email “You asked, we answered: What you wanted to know about the property tax ”. Feedback on “You asked, we answered: What you wanted to know about the property tax ”.